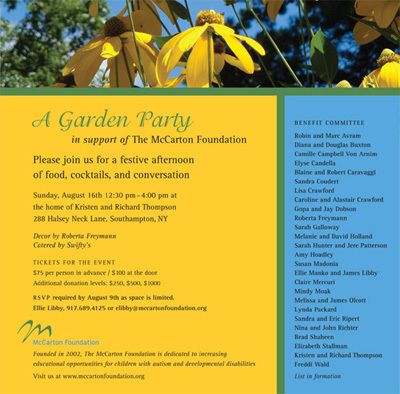 The McCarton Foundation's inaugural Garden Party in the Hamptons will be held Sunday August 16th from 12:30-4:00. It will be a fun filled Mexican theme party being held pool side at the stunning Southampton home of Kristen and Richard Thompson. The McCarton Foundation is one of NYC's leading Schools and Research Centers for autism and developmental disabilities. Decor by Roberta Freymann and catering by Swifty's Restaurant.